Posttransplant lymphoproliferative disorders (PTLDs) are rare but fatal complication of solid organ transplantation. There are only isolated case reports and few case series of Burkitt's lymphoma presenting as PTLD in solid allograft recipients.,, Case series describing Burkitt's lymphoma presenting as PTLD range from 2 to 12 patients. PTLD is usually associated with Epstein–Barr virus (EBV) reactivation in the setting of immunosuppression, and the majority of cases reported in the literature occur within the 1st year of transplantation. Treatment strategies for these disorders include reduction or reduction of immunosuppression, chemotherapy, and the use of immunotherapy with anti-B-cell antibodies. Late onset PTLD is usually a monomorphic lesion, negative for EBV markers with a poor response to treatment when compared to early onset PTLD. Our case report represents an uncommon presentation of PTLD with respect to the late-onset presentation of PTLD and the histopathological diagnosis of Burkitt's lymphoma, which is rarely reported as a PTLD in the literature. Mr. X, a 46-year-old male, a renal allograft recipient on triple immunosuppression (tacrolimus 0.5 mg twice daily, azathioprine 50 mg daily, and wysolone 5 mg daily) was admitted with complaints of anorexia and weight loss of 1-month duration. He denied any history of fever, diarrhea, or malena. On evaluation, he was afebrile with normal vital signs. There was no generalized lymphadenopathy. Abdominal examination revealed mild diffuse tenderness in the epigastrium with no palpable mass or hepatosplenomegaly. There was no rigidity, guarding, or graft tenderness. He had undergone a live-related renal transplantation at our hospital in April 2005; His spouse was the donor, with a 6/6 antigen mismatch. Induction was with two doses of intravenous Anti-Thymocyte Globulin (ATG) 50 mg each, methylprednisolone, tacrolimus, and mycophenolate mofetil. Maintenance immunosuppression was with a triple-drug regimen of tacrolimus, mycophenolate mofetil, and steroids. His posttransplant period was complicated by one episode of acute cellular rejection (Banff g0t3i2v1) for which he received antirejection therapy with three pulses of intravenous methylprednisolone, 250 mg each. His graft functions stabilized with a baseline serum creatinine of 1.4 mg/dL (reference: 0.5–1.4 mg/dL). The mycophenolate mofetil was switched to azathioprine 1.5 mg/kg/day at the end of 1-year posttransplant because of financial constraints. He developed new-onset diabetes mellitus at 15-month postrenal transplant. His blood sugars were controlled with oral hypoglycemic agents, diet, and lifestyle modifications. Hypertension was well controlled with 5 mg of prazosin and clonidine 100 mcg thrice daily. He was admitted and evaluated. Routine blood investigations revealed normochromic normocytic anemia, normal leukocyte counts and differential counts, normal renal function and normal liver function tests, and urinalysis. The tacrolimus trough (t0) level was 4.8 ng/mL (reference: 5–20 ng/mL) [Table 1]. A gastroenterology consultation was sought, and he was planned for a plain computerized axial tomography (CT) abdomen and esophagogastroduodenoscopy (EGD). 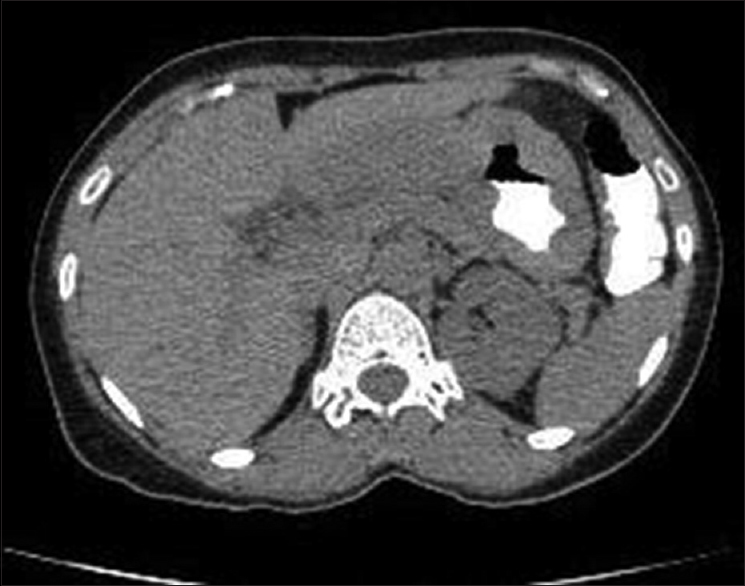 CT abdomen was reported as circumferential gastric wall thickening involving almost the entire stomach with enlarge gastroepiploic, pyloric, and celiac nodes. Liver architecture was reported normal. The final CT report suggested the possibility of carcinoma stomach with local infiltration and metastatic lymph nodes [Figure 1]. EGD showed multiple gastric ulceroinfiltrative lesions [Figure 2]. Biopsy of the gastric lesions was consistent with diffuse gastric mucosal infiltration with a neoplasm made of sheets of neoplastic cells resembling a poorly differentiated neoplasm [Figure 3]. 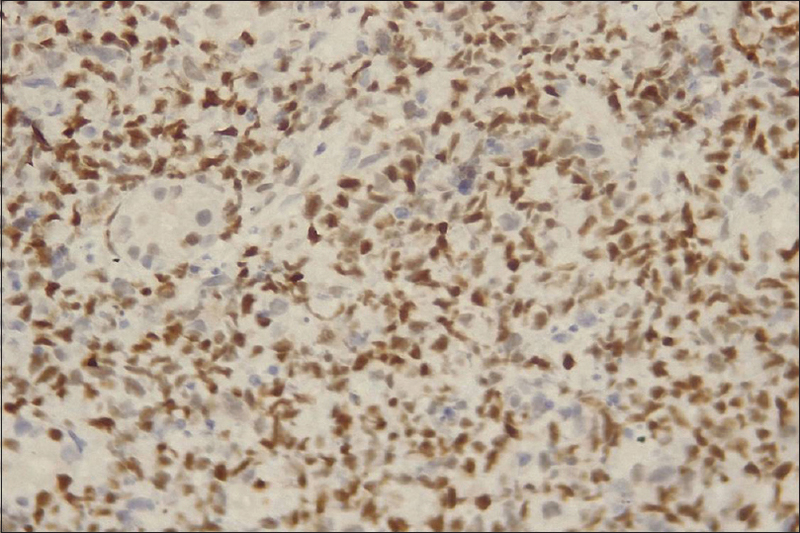 Immunohistochemistry (IHC) of the lesion was consistent with Burkitt's type high-grade B-cell lymphoma [Figure 4]. The neoplastic cells were positive for leukocyte common antigen, CD20, CD10, Cmyc, and Ki67 index >98%. They were negative for CK, CD3, tdt, cyclin D1, CD30, and bcl2. The EBV status of the patient was negative. His immunosuppressive medications were reduced – tacrolimus was withdrawn, and he was continued on azathioprine 50 mg daily and wysolone 5 mg daily. The patient was referred to medical oncology for further evaluation and treatment. He was advised further evaluation including a bone marrow biopsy and positron emission tomography scan before commencing on a definitive chemotherapeutic treatment. Since the patient had no insurance cover and the treatment expensive and prolonged, the family decided to undertake further treatment at their hometown in consultation with an oncology center. We were informed by the relatives of the patient that he succumbed to sepsis 3 weeks following chemotherapy at the local oncology center. Lymphomas that occur in solid allograft recipients or allogeneic hematopoietic stem cell (HSC) recipients are grouped under the term PTLD. In the solid organ recipients, about 21% of all malignancies are due to PTLD in contrast to 4%–5% in the general population. The incidence of PTLD is increasing in the solid allograft recipients. Among the solid allograft recipients, the maximum incidence is seen in multi-organ and intestinal transplants (20%), while the least incidence is seen with renal transplant recipients (0.8%–2.5%)., Beside the organ transplanted, the other major risk factors which have been implicated in the development of PTLD include EBV mismatch at the time of transplantation (recipient EBV negative and donor EBV positive), type of induction immunosuppressive therapy (use of B-cell-depleting antibodies, e.g., thymoglobulin), and class of immunosuppressive medication used for maintenance therapy (tacrolimus and azathioprine). The clinical manifestations of PTLD are highly variable and can range from asymptomatic incidental findings to a severe systemic presentation, for example, fever and organ failure. The diagnosis of PTLD is confirmed by the histopathological examination of the biopsied tissue, immunohistochemical studies, and cytogenetic studies. Reduction of immunosuppression, local radiation, immunotherapy with rituximab, chemotherapy, stem-cell therapy, and cellular immunotherapy are the various modalities used in the treatment of PTLD. Burkitt's lymphoma is a highly aggressive monomorphic B-cell neoplasm. cMyc gene on chromosome 8 undergoes translocation and dysregulation in Burkitt's lymphoma. The incidence of Burkitt's lymphoma presenting as PTLD is rare in the literature with isolated case reports and very few case series. Three separate clinical entities of Burkitt's lymphoma are recognized – endemic, sporadic, and immunodeficiency associated. These three different forms are histologically similar with the same clinical behavior and are treated in a similar manner. Immunodeficiency-associated Burkitt's lymphoma is seen with recipients of solid allograft transplants, recipients of HSC transplants, and patients with human immunodeficiency virus infection. The diagnosis of Burkitt's lymphoma is confirmed by the histopathological study of the biopsied tissue. The Burkitt's lymphoma cells are monomorphic cells with round nuclei and basophilic cytoplasm. 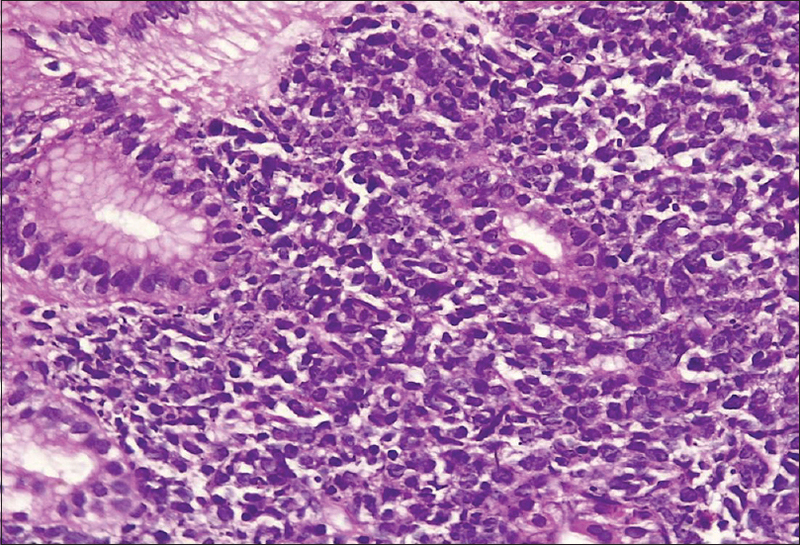 The appearance is classically described as starry-sky pattern due to the basophilic tumor cells interspersed with histiocytes that have ingested the tumor cells. On IHC, B-cell antigens are expressed by these cells (CD19/20, CD22, and CD79a). The fraction of Ki67+ (MIB-1+) is very high due to the high growth rate of the tumor. Translocations involving cMyc can be demonstrated by cytogenetics. There are only few case reports and case series on Burkitt's lymphoma presenting as PTLD in recipients of solid allograft recipients.,, Most of the case series reports described are among the pediatric transplant population reflecting the increased incidence of PTLD in this population due to the increased prevalence of EBV-negative status of the recipients. In the case report by Naik et al., the adult patient who developed Burkitt's lymphoma was a multi-organ recipient who presented with submandibular swelling and an ileocecal mass. The time of presentation was 3 years posttransplantation, and the EBV status of the patient was negative. In the review of the case series by Picarsic et al., 12 solid allograft recipients developed Burkitt's lymphoma. All the patients were children, ranging from 9 weeks to 16 years, with a median of 2.9 years. Burkitt's lymphoma occurred in these recipients on an average of about 52 months posttransplant. The common symptoms on presentation were an extranodal mass and abdominal pain. Pretransplant EBV status was negative in the majority of the patients; however, most of the patients were positive for EBV at the time of diagnosis of Burkitt's lymphoma. Gastrointestinal manifestation as tumors was the initial presentation of the two patients aged 12 and 44 years in the case series reported by Pasquale et al. EBV was strongly positive and the presentation was late, years after the solid organ transplant. Our patient presented with an extranodal site of involvement, i.e., gastric tumor. He developed Burkitt's lymphoma 12 years after renal transplantation. The presentation was nonspecific with vague abdominal symptoms, anorexia, and weight loss. EBV status was negative. CT scan of the abdomen and the esophagoduodenoscopy of the lesion initially suggested the possibility of an infiltrating carcinoma stomach; however, IHC of the lesion confirmed the diagnosis of Burkitt's lymphoma highlighting its importance and value in the diagnosis of PTLD. Recipients of solid allografts, on immunosuppressive medications present with nonspecific symptoms and signs, are vulnerable to develop PTLD years after transplantation. This group of patients warrants detailed evaluation including imaging studies, endoscopy, and biopsy to confirm the diagnosis. We would like to thank the Department of Pathology, Lakeshore Hospital, Cochin, Kerala, India. Naik S, Tayapongsak K, Robbins K, Manavi CK, Pettenati MJ, Grier DD, et al. Burkitt's lymphoma presenting as late-onset posttransplant lymphoproliferative disorder following kidney and pancreas transplantation: Case report and review of the literature. Case Rep Oncol 2013;6:6-14. Pasquale MA, Weppler D, Smith J, Icardi M, Amador A, Gonzalez M, et al. Burkitt s lymphoma variant of post-transplant lymphoproliferative disease (PTLD). Pathol Oncol Res 2002;8:105-8. Picarsic J, Jaffe R, Mazariegos G, Webber SA, Ellis D, Green MD, et al. Post-transplant burkitt lymphoma is a more aggressive and distinct form of post-transplant lymphoproliferative disorder. Cancer 2011;117:4540-50. Engels EA, Pfeiffer RM, Fraumeni JF Jr., Kasiske BL, Israni AK, Snyder JJ, et al. Spectrum of cancer risk among US solid organ transplant recipients. JAMA 2011;306:1891-901. Opelz G, Döhler B. Lymphomas after solid organ transplantation: A collaborative transplant study report. Am J Transplant 2004;4:222-30. Dierickx D, Tousseyn T, Sagaert X, Fieuws S, Wlodarska I, Morscio J, et al. Single-center analysis of biopsy-confirmed posttransplant lymphoproliferative disorder: Incidence, clinicopathological characteristics and prognostic factors. Leuk Lymphoma 2013;54:2433-40. Dierickx D, Habermann TM. Post-transplantation lymphoproliferative disorders in adults. N Engl J Med 2018;378:549-62. Swerdlow SH, Campo E, Harris N. World Health Organization Classification of Tumors of Hematopoietic and Lymphoid Tissues. 4th ed. Lyon, France: IARC Press; 2017. p. 453-62. Luskin MR, Heil DS, Tan KS, Choi S, Stadtmauer EA, Schuster SJ, et al. The impact of EBV status on characteristics and outcomes of posttransplantation lymphoproliferative disorder. Am J Transplant 2015;15:2665-73. Schober T, Framke T, Kreipe H, Schulz TF, Großhennig A, Hussein K, et al. Characteristics of early and late PTLD development in pediatric solid organ transplant recipients. Transplantation 2013;95:240-6. Maksten EF, Vase MØ, Kampmann J, d'Amore F, Møller MB, Strandhave C, et al. Post-transplant lymphoproliferative disorder following kidney transplantation: A population-based cohort study. Transpl Int 2016;29:483-93. Morton M, Coupes B, Roberts SA, Klapper PE, Byers RJ, Vallely PJ, et al. Epidemiology of posttransplantation lymphoproliferative disorder in adult renal transplant recipients. Transplantation 2013;95:470-8. Thorley-Lawson DA, Gross A. Persistence of the Epstein-Barr virus and the origins of associated lymphomas. N Engl J Med 2004;350:1328-37. Fink SE, Gandhi MK, Nourse JP, Keane C, Jones K, Crooks P, et al. A comprehensive analysis of the cellular and EBV-specific microRNAome in primary CNS PTLD identifies different patterns among EBV-associated tumors. Am J Transplant 2014;14:2577-87. Morscio J, Dierickx D, Ferreiro JF, Herreman A, Van Loo P, Bittoun E, et al. Gene expression profiling reveals clear differences between EBV-positive and EBV-negative posttransplant lymphoproliferative disorders. Am J Transplant 2013;13:1305-16. Lacasce A, Howard O, Lib S, Fisher D, Weng A, Neuberg D, et al. Modified magrath regimens for adults with Burkitt and Burkitt-like lymphomas: Preserved efficacy with decreased toxicity. Leuk Lymphoma 2004;45:761-7. Mead GM, Sydes MR, Walewski J, Grigg A, Hatton CS, Pescosta N, et al. 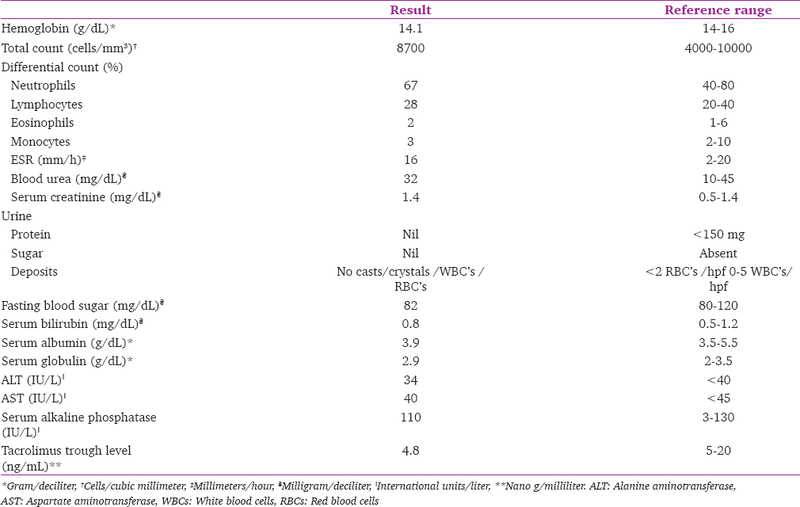 An international evaluation of CODOX-M and CODOX-M alternating with IVAC in adult Burkitt's lymphoma: Results of United Kingdom lymphoma group LY06 study. Ann Oncol 2002;13:1264-74.